Are you my next target? Professor Robert Hare, the world’s foremost expert in the field, estimates that there are at least two million psychopaths in North America. …or a sensible knave if you saw one? In this brief, accessible essay, contemporary philosopher Bianco Luno reminds us that Hume’s knave, aka psychopath, still haunts our world. The handcrafted mini book is 21 pages and approximately 3.1 x 3.6 inches. In the early 1800s, doctors became aware that some patients who appeared outwardly normal were lacking what we would call a conscience. They were described as morally depraved or morally insane. 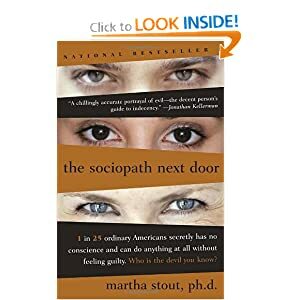 The term psychopath was first used around 1900, then changed to sociopath in the 1930s to emphasize the damage afflicted individuals do to society. Today, researchers have returned to using the term psychopath. When Freud obtained his medical degree in 1881, the term psychopath had not yet been introduced. 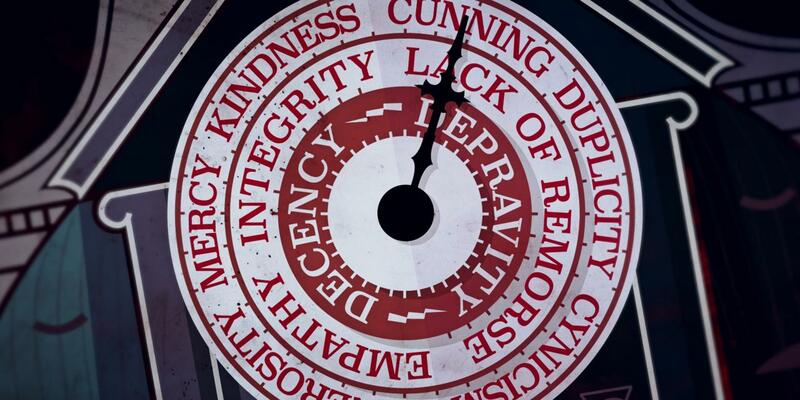 …it is by no means the rule that virtue is rewarded and wickedness punished, but it happens often enough that the violent, the crafty, and the unprincipled seize the desirable goods of the earth for themselves while the pious go empty away. Dark, unfeeling, and unloving powers determine human destiny; the system of rewards and punishments, which, according to religion, governs the world, seems to have no existence. New Introductory Lectures on Psycho-analysis, Lecture 35, A Philosophy of Life. It will give you a basic psychopathy education and maybe a new perspective on humanity and understanding of why the world is the way it is. A convincing academy award-winning portrayal of a young woman with ASPD was given by Angelina Jolie who played the role of Lisa Rowe in the 1999 movie Girl, Interrupted. The following list is a collection of some of the more commonly observed behaviors and traits of people with Narcissistic Personality Disorder (NPD). Click on the links on each trait for much more information and some ideas for coping with each. Note that these traits are given as a guideline only and are not intended for diagnosis. Each individual with ASPD is unique and so each one will display a different subset of traits. Also, note that everyone displays “antisocial” behaviors from time to time. Exhibiting one or more of these traits doesn’t necessarily qualify for a diagnosis of ASPD. See the DSM Criteria for diagnostic criteria. Acting Out • Acting Out behavior refers to a subset of personality disorder traits that are more outwardly-destructive than self-destructive. Anger • People who suffer from personality disorders often feel a sense of unresolved anger and a heightened or exaggerated perception that they have been wronged, invalidated, neglected or abused. 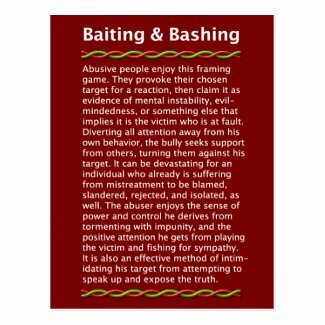 Baiting • A provocative act used to solicit an angry, aggressive or emotional response from another individual. Belittling, Condescending and Patronizing • This kind of speech is a passive-aggressive approach to giving someone a verbal put-down while maintaining a facade of reasonableness or friendliness. Blaming • The practice of identifying a person or people responsible for creating a problem, rather than identifying ways of dealing with the problem. Bullying • Any systematic action of hurting a person from a position of relative physical, social, economic or emotional strength. Chaos Manufacture • Unnecessarily creating or maintaining an environment of risk, destruction, confusion or mess. Cheating • Sharing a romantic or intimate relationship with somebody when you are already committed to a monogamous relationship with someone else. Chronic Broken Promises • Repeatedly making and then breaking commitments and promises is a common trait among people with personality disorders. Cruelty to Animals • Acts of cruelty to animals have been statistically discovered to occur more often in people with personality disorders than in the general population. Denial • Believing or imagining that some painful or traumatic circumstance, event or memory does not exist or did not happen. Depression • When you feel sadder than you think you should, for longer than you think you should – but still can’t seem to break out of it – that’s depression. People with personality disorders are often also diagnosed with depression resulting from mistreatment at the hands of others, low self-worth and the results of their own poor choices. Domestic Theft • Consuming or taking control of a resource or asset belonging to (or shared with) a family member, partner or spouse without first obtaining their approval. Emotional Abuse • Any pattern of behavior directed at one individual by another which promotes in them a destructive sense of Fear, Obligation or Guilt (FOG). 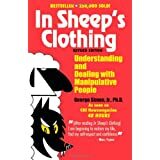 False Accusations • False accusations, distortion campaigns and smear campaigns are patterns of unwarranted or exaggerated criticisms which occur when a personality disordered individual tries to feel better about themselves by putting down someone else – usually a family member, spouse, partner, friend or colleague. Favoritism • Favoritism is the practice of systematically giving positive, preferential treatment to one child, subordinate or associate among a family or group of peers. Fear of Abandonment • A pattern of irrational thought exhibited by some personality-disordered individuals, which causes them to occasionally think they are in imminent danger of being rejected, discarded or replaced by someone close to them. Feelings of Emptiness • Some personality-disordered individuals experience a chronic and acute sense of nothingness or emptiness, and so believe that their own existence has little worth or significance outside the context of strong physical sensations and relationships with others. Grooming • Grooming is the predatory act of maneuvering another individual into a position that makes them more isolated, dependent, likely to trust, and more vulnerable to abusive behavior. Harassment • A sustained or chronic pattern of unwelcome behavior directed toward an individual or group. Impulsiveness • The tendency to act or speak based on current feelings rather than logical reasoning. Intimidation • Any form of veiled, hidden, indirect or non-verbal threat. Invalidation • The creation or promotion of an environment which encourages an individual to believe that their thoughts, beliefs, values or physical presence are inferior, flawed, problematic or worthless. Lack of Boundaries • A lack of boundaries is often at the root of long-term abusive relationships. Lack of boundaries means the absence of rules, limits and guidelines for acceptable behavior. Inconsistent or intermittent reinforcement of consequences for inappropriate behavior is common among both abusers and abuse victims. Lack of Conscience • Individuals with personality disorders are often preoccupied with their own agendas, sometimes to the exclusion of the needs and concerns of others. This is sometimes interpreted by others as a lack of moral conscience. Low Self-Esteem • A common term used to describe a group of negatively distorted self-views which are inconsistent with reality. Manipulation • The practice of baiting an individual or group of individuals into a certain response or reaction pattern for the purpose of achieving a hidden personal goal. Mood Swings • Unpredictable, rapid, dramatic emotional cycles which cannot be readily explained by changes in external circumstances. Name-Calling • A form of Verbal Abuse which people sometimes indulge in when their emotional thought processes override their rational thought processes. Narcissism • This term describes a set of behaviors characterized by a pattern of grandiosity, self-centered focus, need for admiration, self-serving attitude and a lack of empathy or consideration for others. Neglect • A passive form of abuse in which the physical or emotional needs of a dependent are disregarded or ignored by the person responsible for them. Normalizing • Normalizing is a tactic used to desensitize an individual to abusive, coercive or inappropriate behaviors. In essence, normalizing is the manipulation of another human being to get them to agree to, or accept something that is in conflict with the law, social norms or their own basic code of behavior. “Not My Fault” Syndrome • The practice of avoiding personal responsibility for one’s own words and actions. Objectification • The practice of treating a person or a group of people like an object. Pathological Lying • Persistent deception by an individual to serve their own interests and needs with little or no regard to the needs and concerns of others. A pathological liar is a person who habitually lies to serve their own needs. Physical Abuse • Any form of voluntary behavior by one individual which inflicts pain, disease or discomfort on another, or deprives them of necessary health, nutrition and comfort. Proxy Recruitment • A way of controlling or abusing another person by manipulating other people into unwittingly backing you up, speaking for you or “doing your dirty work” for you. Push-Pull • A chronic pattern of sabotaging and re-establishing closeness in a relationship without appropriate cause or reason. Raging, Violence and Impulsive Aggression • Explosive verbal, physical or emotional elevations of a dispute that are disproportionate to the situation at hand. Ranking and Comparing • Drawing unnecessary and inappropriate comparisons between individuals or groups. Sabotage • The spontaneous disruption of calm or status quo in order to serve a personal interest, provoke a conflict or draw attention. Scapegoating • Singling out an individual or group for unmerited negative treatment or blame. Self-Loathing • An extreme hatred of one’s own self, actions or one’s ethnic or demographic background. Sexual Objectification • The act of viewing another individual in terms of their sexual usefulness or attractiveness rather than pursuing or engaging in a quality of personal relationship with them. Shaming • The difference between blaming and shaming is that in blaming someone tells you that you did something bad, in shaming someone tells you that you are something bad. Splitting • The practice of regarding people and situations as either completely “good” or completely “bad”. Stalking • Any pervasive and unwelcome pattern of pursuing contact with another individual. Targeted Humor, Mocking and Sarcasm • Targeted Humor is any sustained pattern of joking, sarcasm or mockery which is designed to reduce another individual’s reputation in their own eyes or in the eyes of others. Testing • Repeatedly forcing another individual to demonstrate or prove their love or commitment to a relationship. Threats • Inappropriate, intentional warnings of destructive actions or consequences. Triangulation • Gaining an advantage over perceived rivals by manipulating them into conflicts with each other. Verbal Abuse • Any kind of repeated pattern of inappropriate, derogatory or threatening speech directed at one individual by another. They’ve spent decades acquiring and refining a skill set they most likely first learned on the playground. 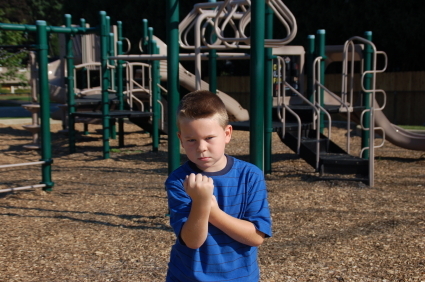 Studies have shown that childhood bullies often grow up to become adult bullies. These “adults” have developed ingenious ways to cover their tracks while making their targets look bad. Methods of tormenting are also more sophisticated. The direct in-your-face approach won’t work in a professional or social setting, so they indulge in underhanded maneuvers and hit-and-run assaults. Adult bullying is particularly insidious. It is often only the targeted individual who knows it is happening. If he tells someone else about it, he is apt to be met with disbelief and possibly also labeled as the troublemaker. The sociopath has planned the whole scheme and has it well rigged with virtual trip wires. The target’s reaction to the abuse becomes additional ammunition for the abuser, who uses it to manipulate bystanders to side with him and to inflict more harm and distress onto his target. 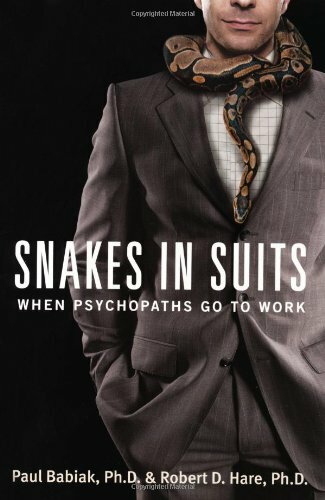 Paul Babiak: Corporate culture today seems ideal for the psychopath. 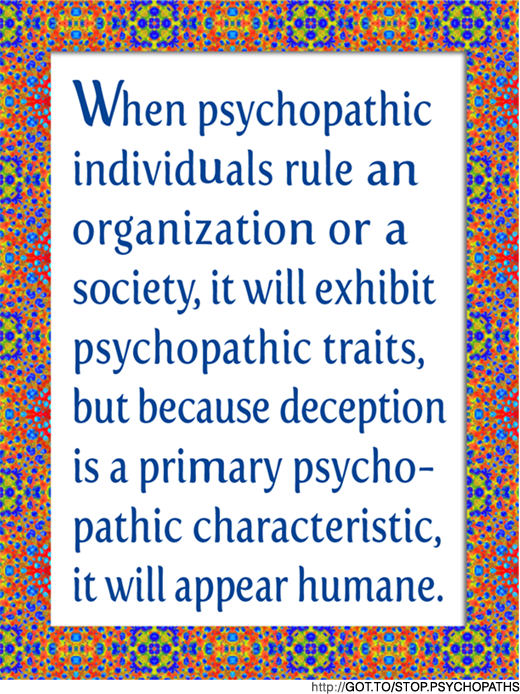 The very things we’re looking for in our leaders, the psychopath can mimic. Their natural tendency is to be charming. Take that charm and couch it in the right business language and it sounds like charismatic leadership. How long will evil prevail? …or Why Do The Bad Guys Always Win? help by sharing your experience and spreading information. Do you know someone who might be a psychopath? It’s possible. Read this and see. Note to viewer: The slideshow should be viewed with a grain of salt. It presents some known psychopathic traits, but in an oversimplified fashion. In the real world, do not expect a psychopathic individual to exhibit all of these traits, or any one of them as obviously or as extremely as the slide show may suggest. Add to Fact #5 about childhood warning signs: cruelty to animals. 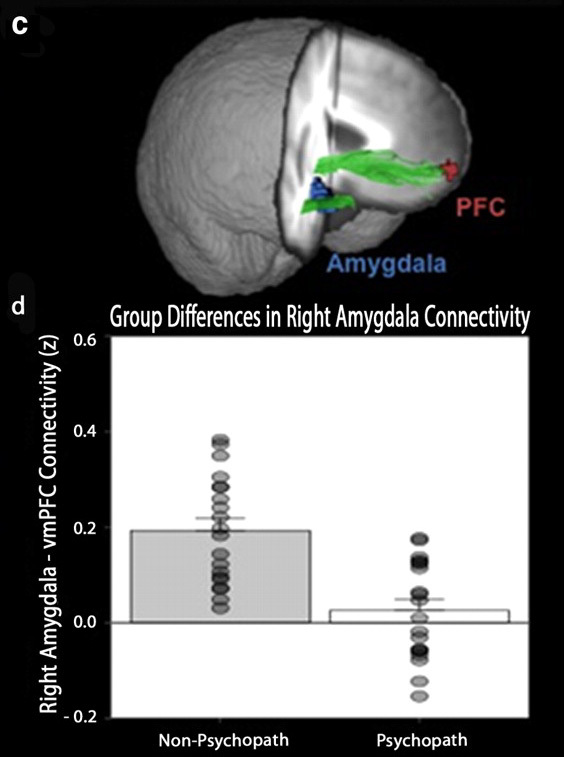 Functional connectivity between the right amygdala and anterior vmPFC is reduced in psychopaths. From Fig. 2 of Motzkin et al., (2011). Psychopathy is a serious personality disorder marked by affective and interpersonal deficiencies, as well as behavioral problems and antisocial tendencies (Cleckley, 1976). Affective and interpersonal traits (termed Factor 1) include callousness and a profound inability to experience remorse, guilt, and empathy; antisocial and behavioral problems (termed Factor 2) include impulsivity, stimulation seeking, and irresponsibility. These symptoms tend to manifest at an early age, continue throughout adulthood, and pervade numerous aspects of psychopaths’ daily functioning. Tell the media about your experiences! 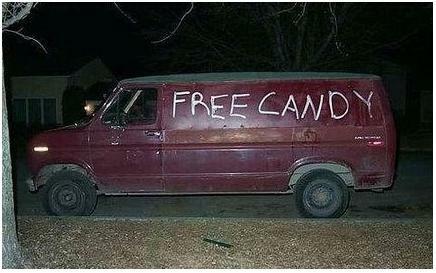 Lovefraud’s mission is to educate the public about sociopaths, and one way to do that is by working with the media. We hope to interest the media in producing stories about disordered personalities, the damage they cause, and how to spot dangerous people before becoming involved. She’s a successful law professor and a Sunday school teacher, with a host of family and friends. But her interpersonal calculus centers on how to manipulate and outmaneuver the many people in her life. Welcome to a world of ruthless cost-benefit analysis, charm, and grandiosity. By M.E. Thomas, published May 7, 2013. Last reviewed on May 19, 2013.